The Microstick boards have various support material that make development a bit easier including the MPLAB® Code Configurator (MCC) along with add-on boards and books to help you get started. These boards are designed to be placed in a breadboard to build your circuitry around. They each include 0.1" header pins that can be inserted into their bottom side socket and connect all the I/O pins to the connection rows of the breadboard. Note: The Microstick is powered from the USB cable. The support circuitry for your application will need its own power supply. The Microstick Plus by ChipCAD is an expansion board for the popular Microstick (DM330013) and Microstick II (DM330013-2) development boards. It provides eleven different peripherals and is suitable for beginners as well as advanced users. This is a cost-effective and versatile platform for education and development. 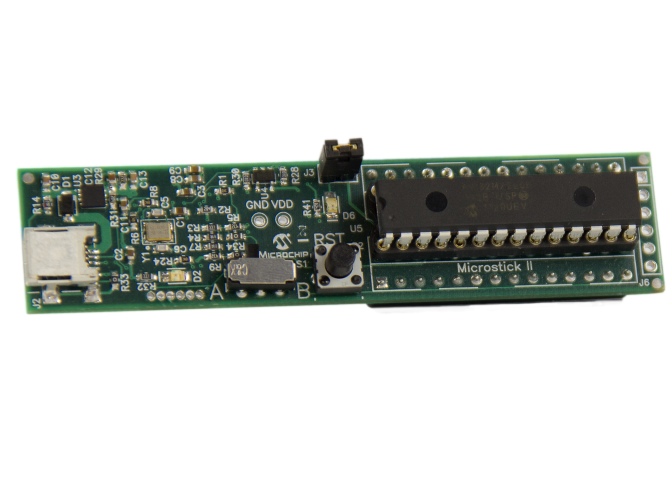 The Microstick Plus USB board provides the hardware interface for Microchip’s USB libraries and example code (see http://en.microstickplus.com/usb/prog), allowing for quick and easy development of USB solutions for Device, Host, or On-The-Go applications. The Microstick Plus USB board can be used alone with the Microstick II to develop on 28-pin microcontrollers with built-in USB peripherals—which include devices from both the 16-bit PIC24F family and the 32-bit PIC32MX2 family. In addition, this board can be connected to the original Microstick Plus Development Board or to a breadboard via pin headers. USB Mini B connector - for device communication. USB Host A connector - for master (Host) communication. USB Micro AB connector - for On-The-Go (OTG) communication. Thomas Kibalo, author of many articles for Nuts & Volts Magazine, delivers an outstanding beginners book for the PIC32. Using the low cost Microstick II starter kit with PIC32MX250F128B MCU and the free MPLAB XC32 Compiler, Kibalo makes learning the PIC32 architecture easy. Code examples demonstrate common operations that many applications require. Hardware is shown in simple breadboard setup so even a beginner can build along with very few extra components needed. This is the book you need if you want to understand how to get started with PIC32 MCUs. Learn to program 16-bit MCUs with a beginners guide by Thomas Kibalo. This popular author has written many articles for Nuts & Volts Magazine. In this book he presents a clear step-by-step introduction to programming Microchip's PIC24H and dsPIC33 MCUs. Code examples utilize the Microstick II development board and the free to download MPLAB XC Compiler. Hardware examples use a simple breadboard setup so that even a beginner can build along with very few extra components needed.